So that's it. The end of summer. For me it's always sweet and sour. The summer can feel like a visiting friend who slightly overstayed their welcome, or if you've spent way too much time indoors (like me), summer can feel like the visiting friend who left before they even unpacked. Part of me is sad to see it go because this happened to be one of those years when I kept talking about the stuff I'd do next summer. I think I've been in the habit of "doing summer" every other year. Maybe my biological clock favors even numbered years! But I'm not really regretful because the other part of me is glad to get free of the stifling heat, marauding mosquitoes, and skin roasting sun rays. I'm totally a girl for the Fall. It's the time of year when I was born so I've always felt the most ME in these months. So whether Labor Day weekend marks your last hurrah or a joyous leap into the new season to come, it's always good to get out there and do something. So on Saturday, Aaron came home after running some errands and just as we're about to settle down to a night of work he says "call Walt. Let's go down to Seaside." This was hilarious on many levels...first off, Walt is seventeen years old and most seventeen year olds are already doing something on the last Saturday night of the summer...not Walt, he answers on the first ring and he's ready to go wherever and do whatever. Another funny thing is the idea of us going down to Seaside. That's short for Seaside Heights, a sprawling Jersey shore resort town with miles of boardwalk, rides, games, mini golf, food galore, ice cream etc...which all sounds right up our alley, but the mix of people that comes along with all that is just not us at all. See, Labor Day weekend is THE biggest clubbing weekend down in Seaside and the town is full of THE most ludicrous exaggerations/cliches/stereotypes of Jersey nightclub types! Wall to wall spray on tans, gallons of hair gel, sunglasses worn til 4 am, scantily clad babes on the arms of cartoonishly muscled men. All of this set against a soundtrack of relentless bass beats and the roar of tinted out Cadillac Escalades. This is what we call entertainment. Sure, we start the night with the boardwalk and the fried Oreos, and the Fudge, and the arcades. But when all that closes down we head a block over to the nightclub district and visuallydrink it all in. It's a world we were never part of and of course never will be. It is so definitively Jersey and although we're New Jersey through and through, we will never identify! So me, Aar, Walt, and Missy just stood around and watched with wide eyed amazement/amusement. We were right in the center of it all, sitting on a bench encroached by the three major nightclubs. We stayed til the wee small hours and unfortunately I bring this tale to you without the aid of snapshots. I felt picture taking would've been risky...we were on shaky ground to begin with being of untanned flesh, modest apparel, and free of intoxicants. We might have been wearing invisibility cloaks! Anyway, it's impossible for me to fully describe the Jersey shore club scene. I only brought this up so I could share with you guys my left-of-center idea of a Labor Day Weekend celebration! Please tell me we're not the only creepy voyeurs out there. I'm sure some of you have your fun in similar ways! And, just so you know, I'm not describing the whole of Seaside. I mean we're not so crazy that we'd go to a place without having some genuine love for it. In the earlier hours of the evening the place is full of families and only THE best seashore stuff. Saltwater taffy in pastel colored boxes, weather worn hand painted signs with images of waffle and ice cream sandwiches...tons of fun stuff for kids, skee ball, souvenirs, loads of nostalgic goodness, black and white photo booths etc. So all of my deep admiration for that stuff gets coupled with the fact that the idea of "nightlife" has always eluded me and what you get in the end is this blog, paintings of cakes, porcelain dolls and paper mache rabbits!.....doesn't it all make perfect sense?! So ok.......end of summer. Bring on the Fall! I cannot thank everyone enough for the positive feedback regarding Charlotte and Mr. Raven! My gosh really! We were sooooo psyched to see a chorus line of Charlottes all queued up and ready to receive their bits of glass glitter before being wrapped and sent to their adoptive homes. We're a bit behind schedule on the next new painting but I promise one is soon to come! Not a day goes by that I don't thank my lucky stars for blogland andall those involved. My first blogiversary approaches and though I wish that during certain periods I found more time to post more often, I'm still proud of the fact that I never once took any aspect of blogging for granted. Over the past year this has been a lifeline for me like you wouldn't believe. It will be one year exactly on September 11th. Aaron cannot believe my choice of date but I was totally unaware of the actual date until just this past week. Totally random and because of it being so completely by coincidence I'm totally fine with it. That day must've found me home, in front of the PC, and looking for an outlet. Well, I found it and I think next Tuesday is birthday number one! And speaking of the benefits of blogging...check out some incredible stuff that was sent by some dear online friends who I'll be meeting in person at Silver Bella in just a couple of months!! I am still in shock about all of that!! Seriously too Cool!! First, there's Jenn's little revamped party girl fashioned from an adorable bisque doll. She's part of a one on one swap...I love her and the lil bit of magic she's been sprinkling about. Jennifer, your package will be on it's way soon! 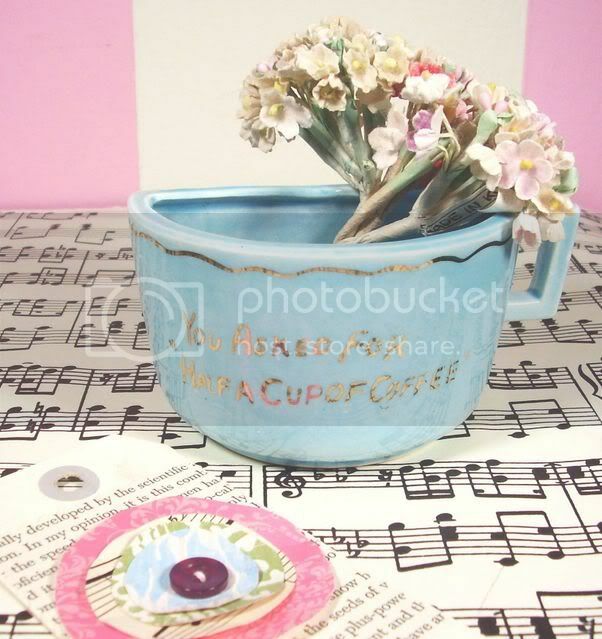 Next, sweet as candy Jessi found this happy birthday plate and kitschy "you asked for a halfa..." coffee cup while out antiquing, and she thought of me! I spied them on Flickr and left comments without knowing that they were already on their way to me. Tooo sweet! I love them both to bits!! And my new friend Kimberlee Edgar whose blog/home/world has often left me near fainting. You must give her a visit and drool along with me! Well, she sent me these adorable ambassadors of Easter. 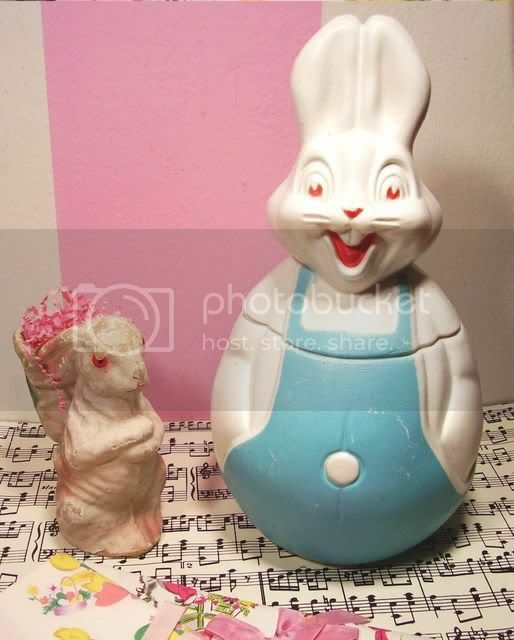 She mailed the plastic bunny cookie jar and old paper mache rabbit knowing that I'd squeal upon their arrival and she couldn't have known me better! Squeal I did! 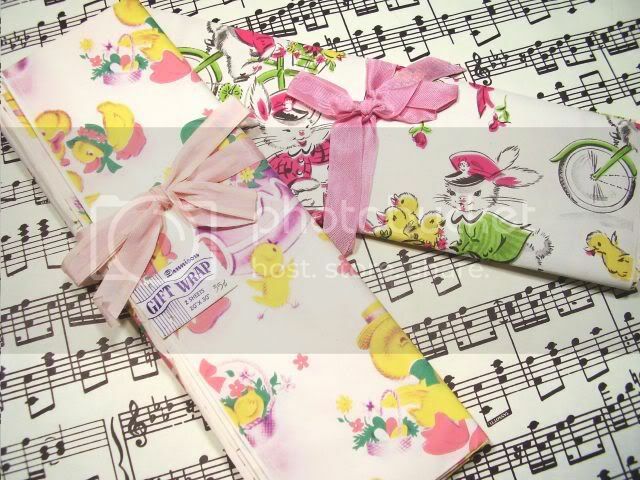 And this vintage Dennison Easter giftwrap...Kimberlee has got my number!! My paper mache rabbit family welcomes the new guy with open arms!! Ok, I hope all you guys had an amazing summer and a great last hurrah before sending the little guys and gals back to their classrooms. If any of you have voyeuristic habits like us nuts over hear please leave your stories as comments below just so everyone can see that I'm just like everybody else!! Wishing everyone a Fabulous Fall!!! Oh Jenny, I love how you write about your trip to the seaside! I can imagine sitting there with you watching the passers by. You're so cute. Love all your photos and I too will welcome fall with its chilly air. Of course here we'll have to wait another month or so. Hi Jenny! We'd almost gone too long without a post from you, but of course it was worth waiting for! I felt like I was right there at Seaside with you! Thanks for the great visuals ;-) Love your goodies. 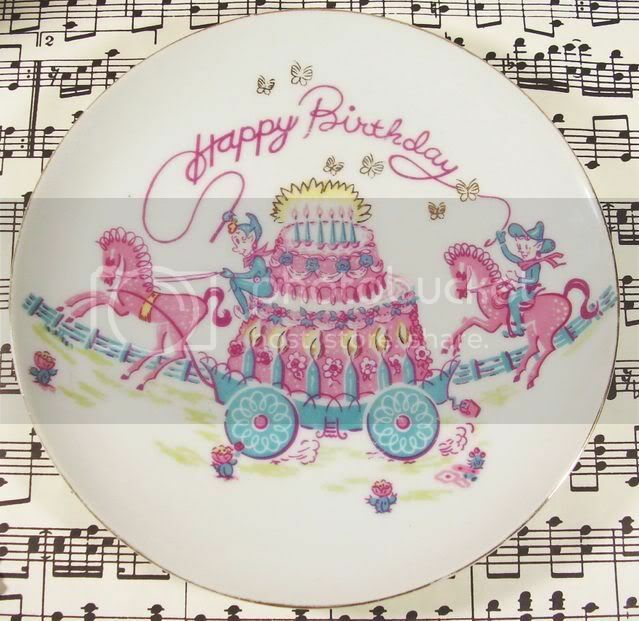 I bought that identical birthday plate at a yard sale here a few months ago, and did THINK of you, but alas; Jessi's nicer than me! lol. I'm always so sorry to see summer end. My sister and I say, "Last one out turn off the light..." because we have so much company in the summer. Long nights, warm weather...I love it all and am sad to see it end. I see a leaf fall and I know I can't stop fall. HooRay! for the Jersey Shore! And I'm very excited to say I will soon be a home owner at the Jersey Shore in Belmar - where DeeJay's has been a legend since even I was going there with my "fake proof." I'm now an old lady and I'm returning to the scene of many of my crimes, this time to sit on the porch and drink tea. Time passes. . .
Love all of the goodies you received. I feel sad summer is over. I love fall but I can't stand winter! Ahhh, the jersey shore! No other place on earth like it, very special! So different from township to township. Great family beaches by day and different personas by eve! you inspire me...happy blogiversary on tuesday! By the way, you've been tagged. Please visit my 9-9-07 blog entry for details! Take care!